New purpose built manufacturing facility. New 60,000 sq. ft. purpose-built production unit financed and constructed by CPG under a ‘turnkey’ arrangement. Located in a prominent location at the entrance to Morlands Business Park. The scheme included two-storey offices of 5,750 sq. ft. and production and warehousing areas of 32,744 sq. ft. and 21,506 sq. ft. respectively, a large secure yard and visitor/staff car parking. 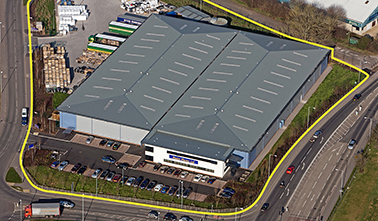 CPG acquired the site from SWRDA on behalf of Avalon Plastics. The building secured a BREEAM ‘excellent' rating of 73.38%. The new Avalon factory was completed to BREEAM ‘excellent’ standard. The building was constructed to Avalon's specific requirements to accommodate specialist cranage, a significantly strengthened floor slab, specialist electrical works including a 2,000 Kw power supply and cooling and product distribution system. The building included the very latest green technology including a biomass boiler, wind turbine and photovoltaic cells. Avalon Plastics Limited who lease the property from Beckery Properties Limited.